On Thursday, USDA’s National Agricultural Statistics Service (NASS) released three updates that provide current insight into the state of the U.S. agricultural economy. The releases focused on land values, cash rents, and production expenditures. Land Values 2018 Summary (August 2018). 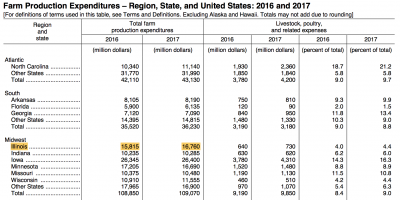 USDA, National Agricultural Statistics Service. 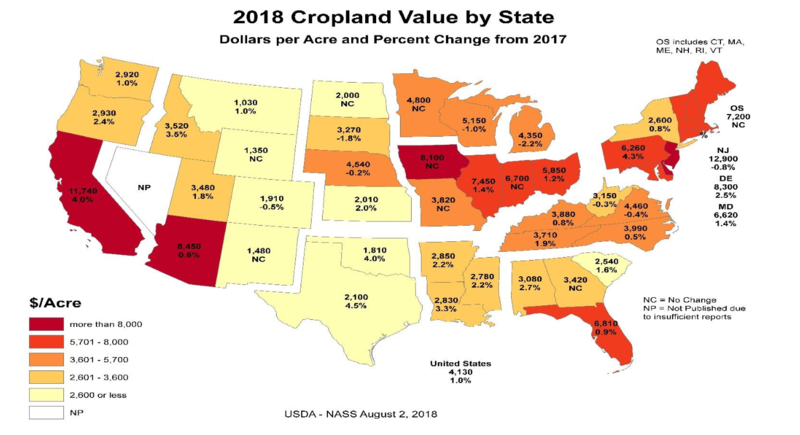 The NASS update also included this more detailed state-by-state graphical look at changes in average cropland values from 2017. 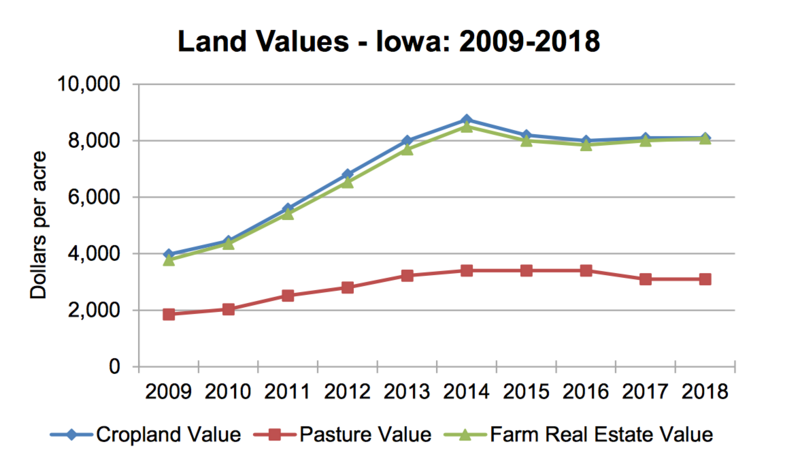 More specific to Illinois, Thursday’s report included this table which indicated that Illinois land values in 2018 averaged $7,450, up 1.4 percent from 2017. 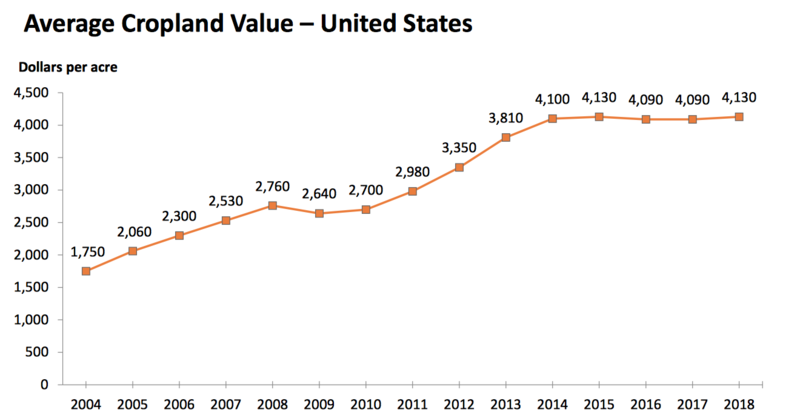 In 2014, the average value was $7,700. Indiana’s cropland value was $6,700 in 2018, unchanged from last year. 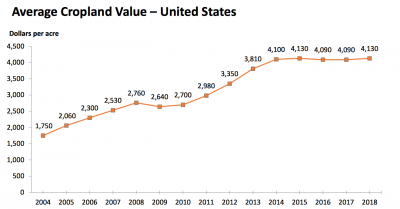 In 2014, the average value was $8,750. 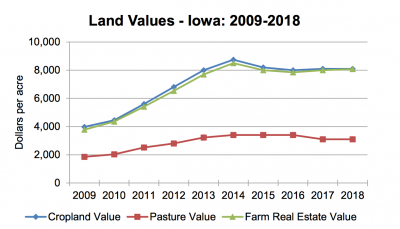 Iowa Ag News – Land Values. Upper Midwest Regional Field Office. NASS- USDA (August 2, 2018). Also on Thursday, NASS updated its Quick Stats Database for Cash Rents. 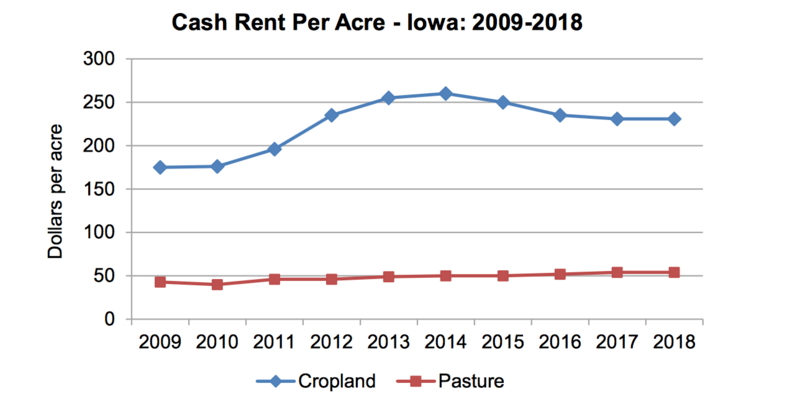 In Illinois, the 2018 average cash rent for cropland is $223, which is up from $218 in 2017 and from $221 in 2016. The Indiana average cash cropland rent in 2018 is $198. 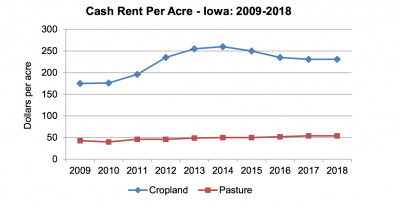 Iowa Ag News – Cash Rent. Upper Midwest Regional Field Office. NASS- USDA (August 2, 2018). With respect to production expenses, NASS released its Farm Production Expenditures 2017 Summary on Thursday as well. 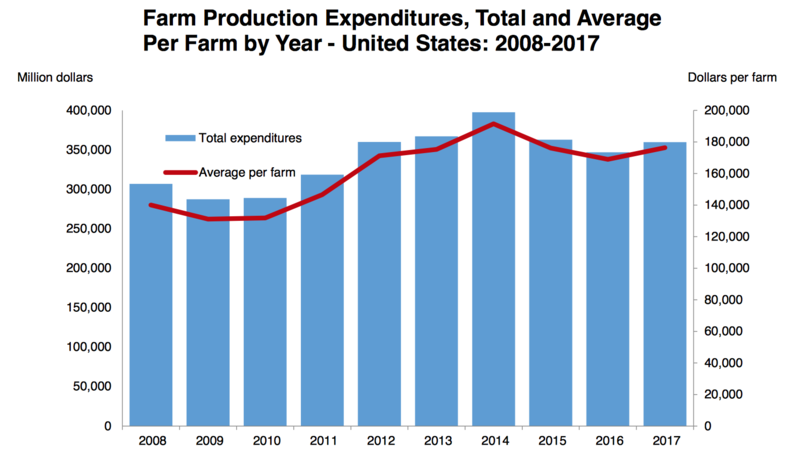 “Farm Production Expenditures 2017 Summary.” NASS-USDA (August 2, 2018). Total farm production expenses in Illinois in 2017 were $16.8 million, up from $15.8 million in 2016. 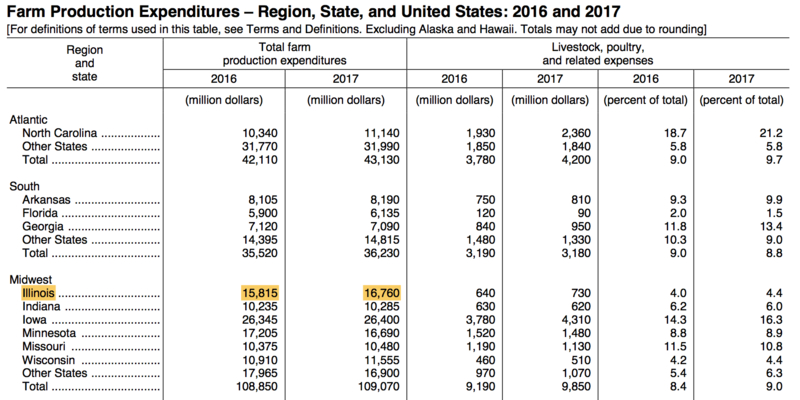 Indiana production expenses totaled $10.3 million in 2017. 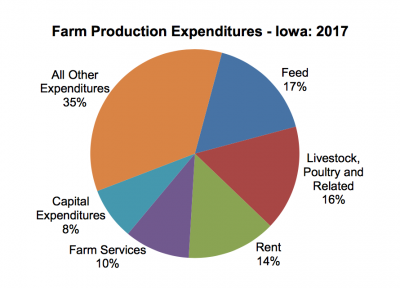 Iowa Ag News – Farm Production Expenditures. Upper Midwest Regional Field Office. NASS- USDA (August 2, 2018).